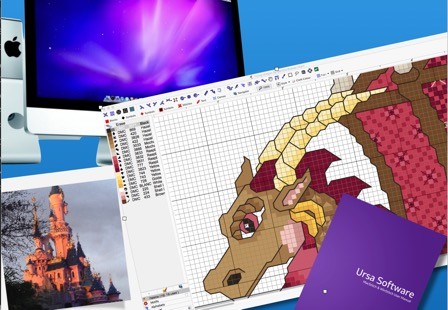 If you are looking for great Cross Stitch / Tapestry / Crochet / Diamond Stitching software at a great price, we have what you are looking for. Whether you plan to convert photos into charts, or design fantastic pieces by hand, our software has been developed over 25 years in conjunction with small business owners all over the globe,to provide you the tools you need to do the job. Our flagship applications: primarily designed to allow you to create and print or publish easy to read cross stitch designs, either converted from photos / clip art, or drawn by hand. Work in color, black and white, a mixture of both, or simulated stitching on screen. Print to paper up to A2 in size, with lots of options, and see the app work out how much thread you will need. Export to PDF files to sell your work online. Add colorways so that you can offer a choice of finish. Diamond Painting is a great new way of working. Plastic 'beads' are available (usually 1/10 inch in size), in common DMC shades. Design or import a picture using DMC shades, and you can view and print at 1/10 inch sizes onto paper, ready to have adhesive applied. Then stick the beads over the printed design and Voila!